I’m a big fan of Steve Magness’ work. He is both a researcher and an in-the-trenches running coach. 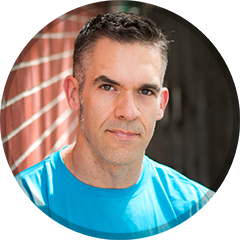 His site the Science of Running is full of excellent information. His book (also titled The Science of Running) is a must-read for running coaches and any serious runner. I can definitely relate to this scenario. I sometimes feel pressure when I observe the accomplishments of others in my field, or when I look at the athletic feats of men my age. It’s easy to feel like I don’t measure up, that I’m not “enough.” Later in this post I’ll give some evidence that by letting my mind wander to others’ achievements, I’m probably undermining my contentment in life. “Which brings me to the point. You can’t force things. In life or in running. You’ve got to let them come to you. There is power in being mentally engaged in the here-and-now rather than longing for the end product. Most of us have probably experienced this when we try really hard at almost anything. From a golf swing to trying to impress a date or a boss, if we bear down too much and try to force it we rarely get the results we want. Process, oh how I love the! I recall conversations about training I’ve had with a friend. Much of his life is devoted to triathlon specifically and intense physical activity generally. We both love physical exertion of a sometimes extreme degree, and we both agree that we dearly love the process. Lifting weights. A track workout. A long bike ride. Learning a new exercise. We love every step towards the end goal. We love the beginning when we feel good, the middle when we’re tired and questioning why we’re doing it, and the glorious end when we feel a sense of accomplishment. In loving the process the end goal comes to us. “We get caught in the rat race of trying to chase success, satisfaction, happiness, and outcomes. The reality is that this is simply an evolutionary mechanism designed to keep us engaged. Researchers have found that it’s not the actual reward that gives us the most bang for our buck in terms of the wonderful feel good hormone of Dopamine. Instead, it’s the chase that gives us the huge bump in Dopamine. He says, “If I only had X, I’d be happy…” I believe a lot of us go through life this way, basing our contentment on external things: a race outcome, a flat stomach, a girlfriend/boyfriend/spouse, money, a house in a certain neighborhood… In other words, we’re looking for the perfect circumstance when everything goes right–then we’ll be happy! In this scenario, we’re looking outside ourselves for contentment, fulfillment and happiness. We’re looking for affirmation of ourselves via things that we may not control. Interestingly, when we achieve one of these things (say hitting a PR in the deadlift, taking 2 minutes off your marathon time or making X amount of money) have we actually found happiness? Maybe…. But often we’ve simply obtained one of these things and we’re not actually any happier, so we keep looking for the next magic thing that will fulfill us. Killingsworth and Gilbert found that people were happiest when making love, exercising, or engaging in conversation. They were least happy when resting, working, or using a home computer. I believe that I’m advocating for finding activities that demand our full mental engagement. The phrase “live in the moment,” seems appropriate (even though it sounds cliche and a bit too cute for my taste–it happens to encapsulate a great concept!) There is a subtle, sublime state of mind that can’t be found by multi-tasking (possibly the ultimate non-focused happiness killer) or keeping up with the Joneses. Further, the focus on the process keeps us “in the moment.” If we can find a love for the process–rather than a fixation on the outcome–then I believe we can find a healthy dose of happiness.